Battle of the Books craziness kept me busy in February and March as students at our elementary school read and engaged in friendly (and sometimes, fierce) competition. And somehow, I let February get away from me without a post for storytime, so today it'll be a double. I love that the students are excited about this award--someone asks each week when the winner will be announced. The kids laughed at Bernadette's way of looking at things, and they spent a lot of time after we had read it saying, "Go back to the page where . . ."
I've said it before, but I can't say it enough: Children love Steve Light's storyboxes. The Girl Who Loves Danger is my favorite. Since it was our second reading in as many weeks, I let the students read the dog's part in RRRalph which they really enjoyed. We went through The Scraps Book at a leisurely pace, stopping to talk about our favorite books along the way. "Mother Doesn't Want a Dog" has long been a favorite poem at our house (ever since my now adult son convinced me he couldn't be a "real boy" without a dog). The Crocodile Who Didn't Like Water wins points in my book for the not-what-I-expected resolution. The students liked the detail on the end papers. The projected release date for Firefight is fall of 2014, but if you are itching to get back into the world of Steelheart, I would suggest reading Brandon Sanderson's novelette, Mitosis: A Reckoners Story. 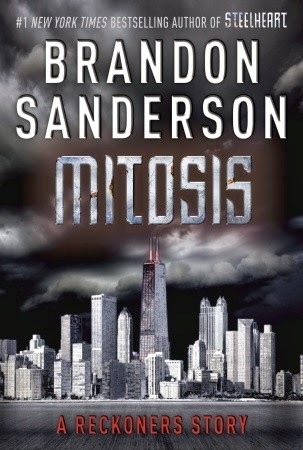 At a mere 35 pages, Mitosis is a quick read that takes you back to dystopian Chicago with the Reckoners and a new Epic. As a caution, there are definite spoilers in these chapters, so read Steelheart first to set up the characters. With just enough details to refresh your memory, this story provides a nice gateway to the series sequel and the inventive new Epic reminds you what was great about Steelheart. The only thing that would make this better? - not having to spend $1.99 for the five chapter story. This seems like the perfect release as a fan-favorite bonus gift. But, in the meantime - definitely a fun read and a nice companion to Steelheart. After numerous nights of leaving the kids home to attend my "book club," a revolt was in the air. They always wanted to come with me (request denied) and required a detailed report the next morning. Rather than risk a full-blown revolution, we decided they needed their own book club. They scanned the bookshelves, chose a book (Knuffle Bunny by Mo Willems) and read it to each other. I brought the treats. I wasn't expecting a gripping discussion from my toddlers, however I was pleasantly surprised by the favorite things each child pointed out. They found the hidden pigeon (a must-find in all Mo Willems books) and showed off their favorite pages. 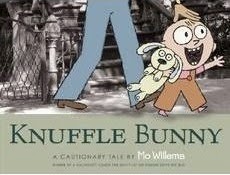 We discussed the pronunciation of the title (my 6-year-old wasn't entirely convinced it was Ku-nuffle - after all the k is always silent before an n, right? ), and practiced our own version of baby babbling to mimic Trixie. Then, after talking about how the pictures were made, we even decided it was time to schedule an art project of our own to mimic the book's pages. Overall, they were thrilled and have a much deeper connection to the book. Who says book clubs are just for adults? This will be a new tradition and I can't wait for our next discussion. Enjoying a book is more than just reading it, and even a child will appreciate a detailed examination of their favorite story. Not only will they inspect the pages more carefully, but their analysis will tie them to the book in a way a casual reading never could.